Imagine coming out of the shower or the tub feeling refreshed and relax, only for that to be ruined by the feeling of having an old and stiff towel rubbing against your skin. In some cases, you might find that cheap towels that are made of synthetic fibers or cotton blends may be causing your allergies, too. Those are some of the reasons why it makes sense to consider organic cotton bath towels. Unlike conventional cotton towels, those that are made of organic cotton are softer and more comfortable to use. They are more absorbent, too, so they are more effective in drying you. Why switch to organic cotton bath towels? Apart from being gentler, comfortable, and absorbent, organic cotton towels are free of toxic chemicals that could enter your body through your pores. If you have ever used colored towels that are made of synthetic fibers, you might be wondering what those strange chemical-like smells are. That is because non-organic towels are either made of synthetic or recycled cotton fibers that were manufactured and treated with harmful pesticides, bleached, and dyed. Your pores are more open after a warm shower or a hot bath, inviting more of the toxic substances into your body and making you more susceptible to allergic reactions and increasing your chances of developing conditions like hormonal imbalance, infertility, and some types of cancers. You do not have to worry about those when you use organic cotton bath towels. It is easier to buy organic cotton bath towels these days, with The Organic Mattress Store offering Made in the USA 100% certified organic cotton bath towels. Regardless of your choice, make sure the cotton is certified 100 percent organic, like those that are made in the US. Avoid towels that are made of only 70 percent organic cotton and 30 percent synthetic and recycled fibers. 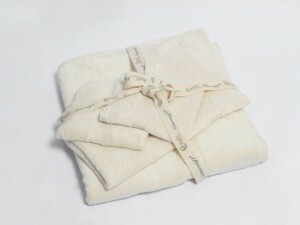 Moreover, prefer organic cotton towels that are not dyed. True organic cotton is not bleached. It is only washed to preserved its purity. Take note that organic cotton bath towels will have an increased absorbency rate after every wash. To preserve their quality, consider using vinegar in a bleach dispenser and avoid using fabric softener.